Are you a fan of Downton Abbey? I didn't watch the first two seasons but after hearing about it from all my friends I had to see what the fuss was about and quickly became a fan as well! Season 4 premieres in the US on Sunday and I'm excited! 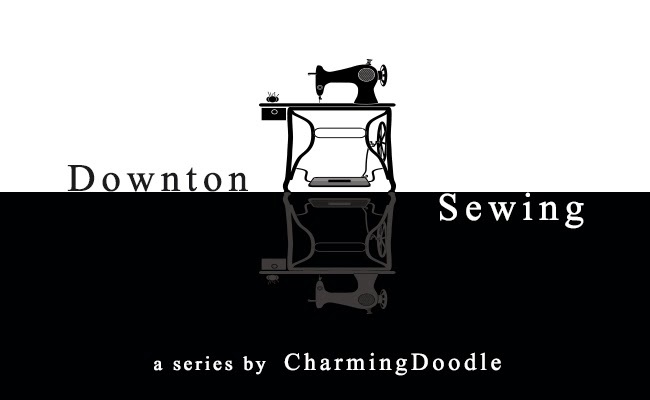 Plus, starting Monday I'm kicking off a two week series on Downton Inspired Sewing. Next week I'll be posting tutorials, round-ups, and inspiration from 1920's fashion and then the week of January 13th some fan fantastic bloggers will be joining in! There are lots of giveaways in store for you too. Be sure to follow CharmingDoodle on bloglovin so you don't miss anything (especially those giveaways)! Total fan. You are the coolest. I don't sew but I look forward to seeing what you come up with! What a great series! Is there going to be a sew-along? Can't wait to see everything... 1920's are great! I got inspired and sewed my little guy a 1920's look :) Thanks for the great series!